^ a b Holmes, Oliver W. (1983). 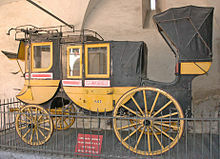 Stagecoach East. ISBN 0-87474-522-5. ^ John Carr, The Stranger in France, or, A tour from Devonshire to Paris London 1803:32. ^ Elizabeth C. MacPhail, Wells Fargo in San Diego, The Journal of San Diego History, Fall 1980, Volume 28, Number 4.